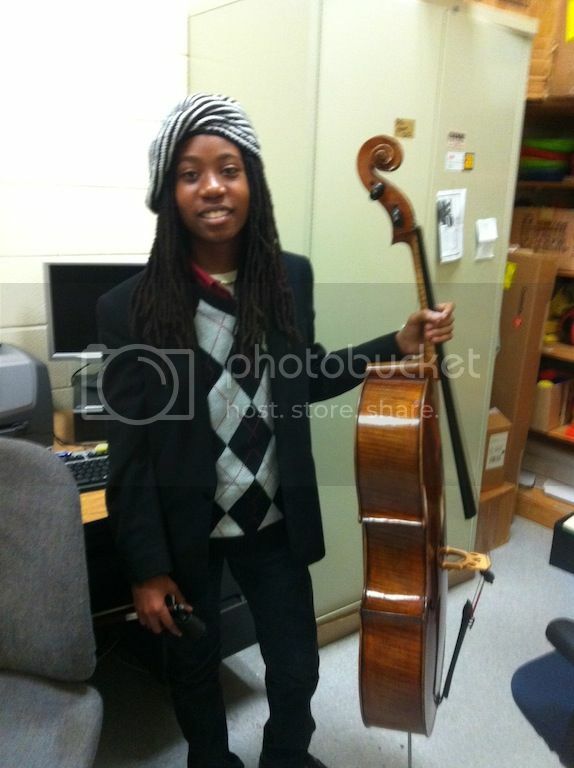 Twelve-year-old musical prodigy Malik Kofi of Birmingham, Alabama, granted an interview with BlackGivesBack.com in recognition of National Mentoring Month. Even as a pre-teen, Malik is intent on cultivating his gifts as a cellist, public speaker, young philanthropist and more, and he’s flourishing with the support of mentors. With his musical mentor, Malik recently performed a duet at Washington, DC’s John F. Kennedy Center for the Performing Arts at the invitation of Marian Wright Edelman and the Children’s Defense Fund. Please tell us more about you and your interests. Donating 15 percent back to all non-profit organizations that pay me to perform. January is National Mentoring Month, who has served as a mentor in your life? Mr. Ed Fields, who is a member of the Birmingham Change Fund (a philanthropic organization) and who runs a business called Relax, It's Handled, which is an association and event management firm. Mr. Udi Bar-David, who is a cellist in the Philadelphia Orchestra and Founding Artistic Director of Intercultural Journeys, a non-profit organization that seeks peace between opposing cultures through music. He is a native of Israel, however now lives in Wynnewood, PA.
How did you meet your mentors, and how did your mentoring relationships develop? I met Mr. Udi Bar-David first. I was attending a summer music camp called the Philadelphia International Music Festival (PIMF) in June of 2012 at Bryn Mawr College. There were approximately 300 students attending this pretty rigorous two-week music program. My grandmother, whom I live with, talked with the student adviser and gathered as much information as possible about the cello instructors. She and the adviser matched me up with Mr. Bar-David. It turned out to be a perfect match!! Our mentoring relationship started after our lessons at PIMF Winter Camp in December 2012. And now, he is my mentor/teacher. I travel almost every month to Pennsylvania and other parts of the country to take lessons from him. I met Mr. Ed Fields officially in October 2012 in Birmingham at an annual Community Investment Network conference. I was asked to perform on the program that evening as part of the youth segment. Mr. Fields was there. Not long after that, he planned my first very own private concert. He gives me advice on which opportunities to take and which ones not to take. He also shows me some of the tricks of the trade in marketing and financial management. And I can't forget all the philosophical talks. However, we have plenty of fun. We fly RC helicopters, watch movies, and many other fun things. For a young person, what's great about having a mentor? First of all, it is great to have my mentors take time out of their personal schedules to fit me in. Then to do the kinds of things they both have done for me make me know that I am wonderfully blessed. As mentors, each serves me in a unique and different capacity. Mr. Bar-David tutors and coaches as well as teaches me cello, while Mr. Fields is a trusted counselor who guides me along many paths as mentioned previously. I loved the way Mr. Bar-David's and my performance went at The Kennedy Center on September 30, 2013. We made our own arrangements of the music we played. It was so much fun preparing for that performance. Mr. Bar-David is clearly the teacher; however, he is open to my suggestions, ideas, and interpretations. To have both these great men in my life to steer, guide, and usher me in the right direction is great! What three suggestions would you offer adults who want to mentor youth? Because I have been fortunate to have two great mentors already, I can only offer the best that has been given to me. Make sure that you (the mentor), the student, and the parent(s) form a partnership. Even though there is a partnership, always maintain the expected level of respect for each other.